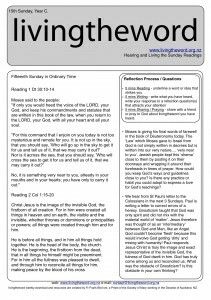 17th Sunday Yr B – paralysed by cost or moved with compassion? Imagine your life, relationships, work- place. How could you practice unity- creating virtues: humility, gentleness, patience, bearing with, striving to preserve unity, maintaining a ʻbond of peaceʼ? What is your biggest challenge? Because the Gospel of Mark (Yr B) has only 16 chapters, we jump into John chapter 6 for 5 weeks to explore Jesusʼ feeing the 5,000. The story of Jesus feeding with ʻbreadʼ is told 6 times in the Gospels. John is the most theologically full with special words and meaning. It is around the Jewish Feast of the Passover. At passover Jewish people remembered Moses the great prophet feeding them with ʻmanna in the desertʼ. The promised Messiah (King) would also do a miraculous feeding. We notice in each of the three Passovers of Jesusʼ public ministry (Jn 2, 6, 19) the passover is fulfilled and replaced ʻwith his bodyʼ. 5 loaves and 2 fish = 7 the perfect Jewish number indicating a perfect feeding. Taking the loaves, gave thanks, gave it to distribute, gather (synagein), fragments (klasma) are all special words used by the early church for the celebration of the Eucharist. Twelve indicates ʻall Jewish tribes / peopleʼ. 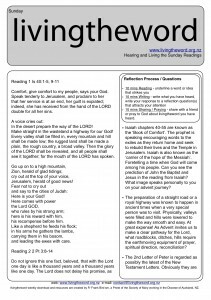 What do you make of all these ʻcluesʼ in the reading today? What does this story now mean for you? The crowds ʻseeʼ the sign Jesus has worked, think of him as ʻtruly the prophetʼ they have been waiting for – the Messiah. The one promised. They wish to make him King. A Political Ruler. Why do you think Jesus ʻwithdrawsʼ? Why is the ʻlifting up of Jesusʼ on the cross the enthronement moment in the gospel of John? Joshua leads God’s people from their long journey in the desert (Exodus) into the ‘promised land’. Shechem (meaning ‘shoulder) is a very important geographical location and an ancient place of worship linked to Abraham. It is the entry point between two mountains. Today is truly a ‘crisis – a ‘decision’ time: will they worship the local gods or Yahweh their LORD? We all place our lives down in service of something. What ‘worship’ temptations do you struggle with? What. Where. How. Who…. do you worship? A basic starting principle is being ‘subordinate’ or ‘give way’ to one another because of our relationship with Jesus. A ‘give way’ sign stops crashes. This ‘code’ of behavior’ is seeking unity. If the wife is to be in imitation of the bride the ‘Church’ and the husband is to be in imitation of Christ, can you see how the typical cultural view of the time is being turned upside down? What challenges you personally in this new ‘family code’ of behavior? Paul places the relationship of marriage into the beautiful mystery of the marriage relationship between ‘Christ and the Church’. In the celebration of the Eucharist the bodily language of love is expressed with the gift of Jesus’ body and blood being received by the Church bringing a one-flesh Holy Communion. How could you make this reception special, more intimate, meaningful? Consider creating your own personal prayer to pray in silence after communion. Today is a crisis – decision time for disciples. Is Jesus a man with strange teaching or the “Holy One of God” teaching Truth? Accepting Jesus will give his Body and Blood is ‘hard’ for them. They are shocked. Their minds and expectations cannot grasp this large and challenging truth The mystery of God leading the heart and mind into belief is involved. Who and what has helped you in your journey of discovery of the Eucharist? Has your journey of faith reached a decision making step of belief in the real, true, substantial presence of Jesus in the Eucharist? Do you believe?